On saturday, I started in the 20 m band and made 2 QSO with 180 mW and 36 mW. The signals on 20 m were strong. On sunday morning I started early on 80 m and later went to 40 m. On these bands I made a total of 26 QSO's all with 2.7 W. Signals were not so strong. Then I went to 20 m. The signals were very strong. I started with 360 mW and reduced the power whenever possible. In a few hours I made another 16 QSO's, from 360 mW down to 3.6 mW, with the FT-817 and attenuators of 10 dB or 20 dB. I was suprised by the short skip distance. In the next picture I plotted the location of the worked stations. You can follow the QSO sequence. Numbers 1 to 18. QSO 1 and 2 were made on saturday and QSO 3 to 18 were made on sunday. Most of the worked stations are concentrated in 4 areas near large cities in the south and the east of the country. München (Munich), Dresden, Cottbus and Berlin. With a shortest distance of 329 miles. On sunday I started with 360 mW in QSO #3. I don't count this QSO for a 1000 Miles per Watt QSO, with just 1001 MPW. It is just to close to the edge. From QSO # 3 on I could reduce the power from 360 mW dowm to 3.6 mW, almost in a staight line. So nearly all QSO's on 20 meter gave more than 1000 MPW. 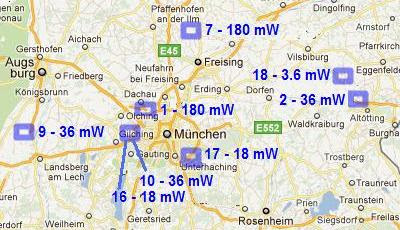 In this plot I give the QSO number and the power of the QSO for the QSO's around the city of München (Munich). QSO #10 and #16 were made with the same station, DL1A. QSO # 16 is a Dupe that was made with just a lower power. Unfortunitely my Sputnik transmitter was not ready for the Sputnik QSO party. After building the transmitter and the two power supplies, tests showed that the oscillator did not work. With no time left for serious trouble shooting, I decided to listen for other Sputniks. 400 milliwatt signal of the Sputnik Peter DL3PB. I could copy the signal of Paul with much QSB. Paul used 5 watts into a 7 element Yagi. I could not hear Peter. If all is correct, the QSO of Peter is good for about 10000 miles per Watt.